Sunset Beach, North Shore, Oahu, HAWAII – (Thursday, December 3, 2015) – World Surf League (WSL) Samsung Galaxy Championship Tour (CT) leader Mick Fanning (AUS) claimed his first event victory in Hawaii at the Vans World Cup of Surfing today after more than a decade of trying. The second stage of the Vans Triple Crown of Surfing, this is the final QS10,000 event of the year and always a favorite of the world’s best surfers. Fanning, 34, took down a star-studded field of CT surfers for the victory: Julian Wilson (AUS), John John Florence (HAW) and Matt Wilkinson (AUS), who placed second through fourth respectively. Fanning only surfed a total of three waves in the 35-minute heat – the least of all the finalists, for an insurmountable combined score of 15.20. Waves were excellent for the duration of the day at 2- to 3-times overhead brushed clean by off-shore winds. With 13 minutes left on the clock, Fanning sat in fourth place, but jumped up to first after garnering a near-perfect 9.87 for a standing barrel combined with a huge re directional wrapping cutback. This win marks the completion of the second gem of the Vans Triple Crown of Surfing, and further solidifies Mick’s world reign. With an incredibly polished style, Fanning showed no sign of fatigue after surfing a marathon of four heats and a total of 2 hours and 5 minutes under the gun at one of the most challenging lineups in the world. Wilson, another world title contender, put on a clinic throughout the entire event to ultimately stand in second on the podium. Also posting an excellent score of 9.47, the 27-year-old showed excellent technique and extra gusto in turns. Wilson took home the Vans Triple Crown title last year, and is fighting this season for the world title. With his sights set on Pipeline for the culminating event of the CT, the Australian has already demonstrated his dedication. Florence was a crowd pleaser all day as he continued to ride barrel after barrel in all four heats surfed. The North Shore expert opened up the heat with a minimal 1.17, but quickly dropped into another tube for his second wave. Stalling to stay covered, Florence glided through two sections and came out clean as the crowd went wild. The 6.67 score put the surfer in second place with 28 minutes still remaining. Wilkinson, the only goofy-footer of the final, found two mid-range scores, a 4.33 and 5.87. With changing ocean conditions for the Final, athletes had to be on top of their game and fight for positioning. Three more awards were up for grabs today and two additional athletes were victorious on the sands of Sunset. Florence captured the World Surf League (WSL) Regional Champion title for his performance throughout the year in WSL-rated Hawaii events. While Florence won the regional title, Ian Walsh (Maui) claimed the $5,000 Vans Travel Award for the top rated regional QS surfer in Hawaii. This will be used when he takes up his QS10,000 seed in 2016 QS events, earned by his rating. Seventeen year-old Jack Robinson (AUS) proved his salt this season and in turn won the JN Automotive Vans Triple Crown Rookie of the Year title. With impressive performances at both Haleiwa and Sunset, Robinson has been an undeniable favorite in the Vans Triple Crown with a mix of modesty and uncanny confidence. This award has long been regarded as the harbinger of a successful pro career. The top 10 QS surfers to qualify for the 2016 WSL Samsung Galaxy Championship Tour were determined today. They are, in order: Caio Ibelli (BRA), Kolohe Andino (USA), Jack Freestone (AUS), Miguel Pupo (BRA), Filipe Toledo (BRA), Alejo Muniz (BRA), Kanoa Igarashi (USA), Alex Ribeiro (BRA), Conner Coffin (USA), Davey Cathels (AUS) and Ryan Callinan (AUS). Should Andino and/or Pupo qualify for next year through the CT event at the Billabong Pipe Masters next week, their QS spots will be given to Stuart Kennedy (AUS) and Dusty Payne (HAW) in that order. The battle for the annual Vans Triple Crown of Surfing title remains wide open. Australian Wade Carmichael, who won the first stop at Haleiwa, still holds a slim lead, followed by Gabriel Medina (BRA), and Dusty Payne, respectively. 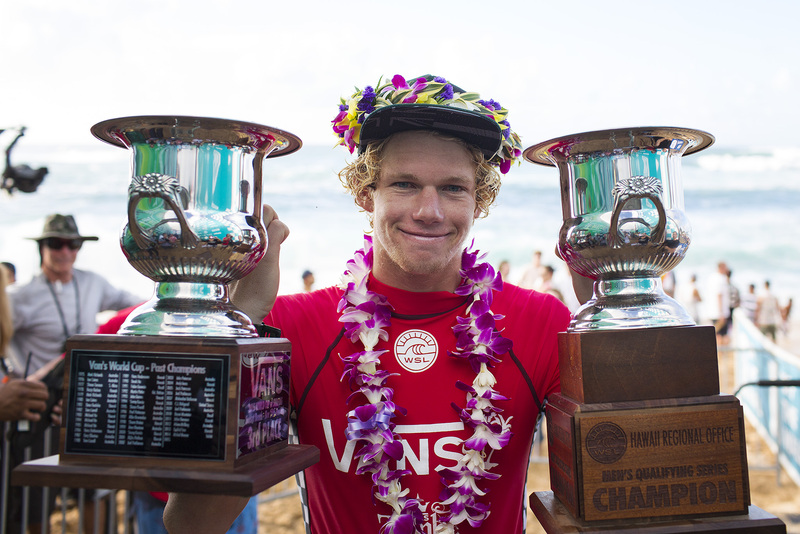 The battle for the World Title and the Vans Triple Crown title now moves to the Billabong Pipe Masters, that gets underway December 8. The forecast already bodes well for a quick start.